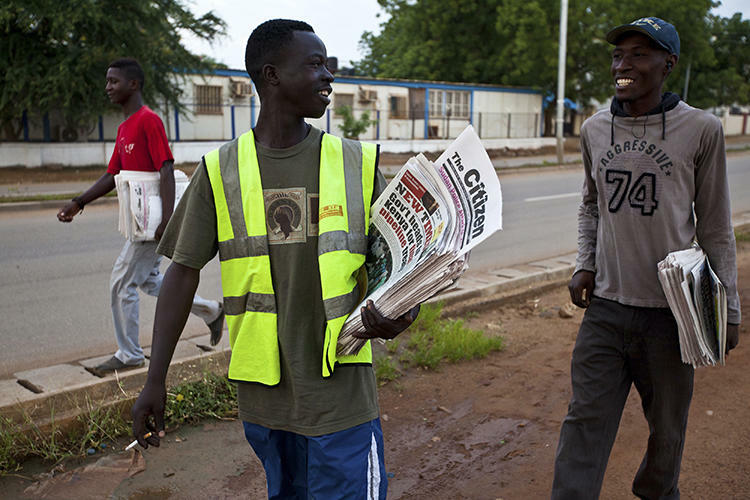 Nairobi, January 18, 2019–South Sudan’s state media regulator should immediately lift an order barring a privately-owned newspaper from covering protests in neighboring Sudan and issue a statement guaranteeing the media’s right to press freedom and editorial independence, the Committee to Protect Journalists said today. On January 7, South Sudan’s Media Authority summoned the editor-in-chief of the local Arabic-language newspaper Al-Watan, Michael Christopher, to a hearing and issued a letter warning the publication to «stop with immediate effect writing anything on topics relating to the ongoing protests in Sudan, which is an internal political issues (sic) of a friendly neighboring country,» according to Christopher and two letters seen by CPJ. While the gag order was directed only at Al-Watan, the summons letter, written by acting Media Authority Managing Director Sapana Abuyi, said, «The media in South Sudan should not write or broadcast instigative statements and comments about [the protests in Sudan].» Local and regional media groups have interpreted this letter as warning all South Sudanese media not to cover the protests. Christopher told CPJ that the Media Authority gave the newspaper 72 hours to apologize to the Sudanese government and its embassy in Juba. He told CPJ he will not issue an apology. The letter warning Al-Watan to stop covering the Sudanese crisis and apologize did not specify what actions the Media Authority may take over his refusal to comply. Christopher also told CPJ that he had received several threatening phone calls from anonymous numbers, including some that threatened the shutdown of the newspaper. In the gag order, the Media Authority cited three opinion pieces authored by Christopher on the Sudan protests published in Al-Watan on January 3, 4, and 7. Christopher told CPJ that the articles were meant to explain the Sudanese crisis and the impact of the events on South Sudan and the rest of the region. The articles were critical of the Sudanese government, and included support for the ouster of Sudanese President Omar al-Bashir, according to media reports and a South Sudanese journalist who reviewed the articles for CPJ. On January 4, Al-Watan published a response to its Sudan coverage authored by Isam Idriss Ibrahim, the charge d’affaires at the Sudanese embassy in Juba, according to Christopher and Ibrahim, who also spoke to CPJ. Ibrahim told CPJ that Christopher’s opinion pieces amounted to hate speech but claimed that the embassy had not complained to the South Sudanese government or asked for Al-Watan to be prohibited from reporting. He also said he did not know about any threatening phone calls made to Christopher. CPJ could not reach South Sudan’s minister of information, Michael Makuei Lueth, on his mobile phone, and text messages went unanswered. The acting director general of the Media Authority, Sapana Abuyi, was also unreachable on his mobile phone and did not respond to an email from CPJ. An employee of the Media Authority also declined to speak to CPJ, saying he was a junior officer and was not authorized to speak on behalf of the organization. He did not respond to a text message requesting that CPJ’s questions be referred to the appropriate official. Numerous journalists working in Sudan have told CPJ that they are facing government pressure while covering protests that have so far led to the deaths of more than 40 people.